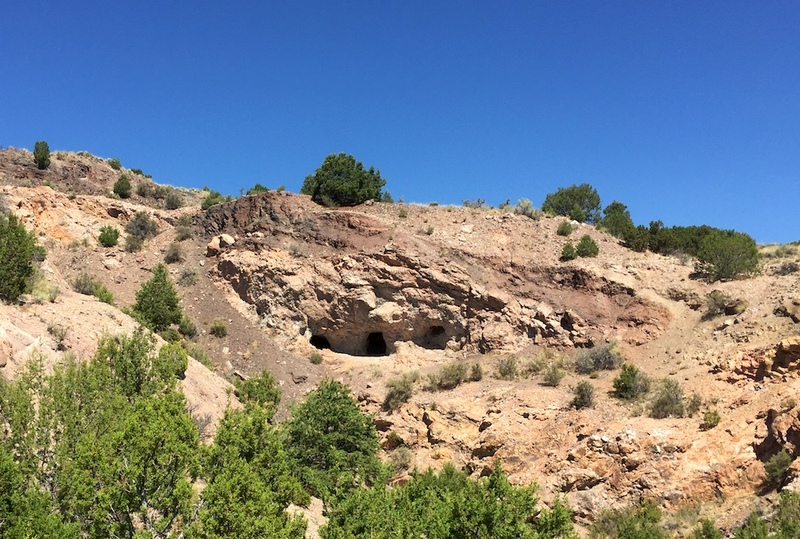 If you’ve traveled in northern New Mexico, you’ve probably heard about Ojo Caliente. It’s a famous hot springs resort west of Taos, and quite a luxurious place to stay. But if you don’t feel like paying the big bucks they ask for a room there, there is free camping near Ojo Caliente. Taos Junction is located west of Taos, at the intersection of highways 285 and 567. If you’re coming from the south, then as soon as you turn east on 567, you’ll take another right immediately onto Forest Road 557. It’s literally right after the intersection. There’s one camping spot you’ll see right away, but it’s pretty trashy and I wouldn’t want to stay there. If you keep driving down Forest Road 557, you’ll see various other possibilities that are much more secluded and attractive. The area has a lot of sage brush, and some pinyon and juniper trees, and I was able to find a nice shady spot, with some privacy away from the road. It may not be the most beautiful place ever, but it is easy, and very convenient if you want to visit Ojo Caliente or if you’re just passing this way. I stayed at a couple of different campsites down here, both of which had obviously been used by campers before. 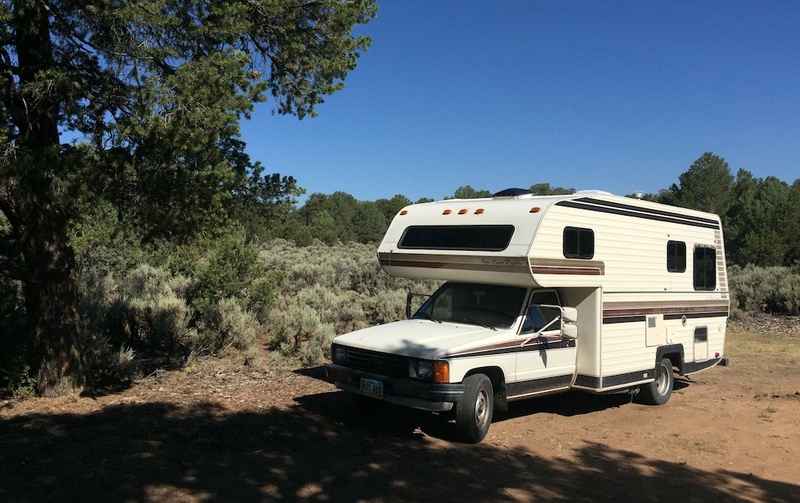 Aside from the stone fire circles, there are no facilities – this is just plain boondocking. And I had good LTE cell service on T-Mobile – yay! When I was there, the Forest Road leading in was dry and it was no problem for Zennie. But there were sizable ruts that indicated it could be pretty tricky if it was muddy, so I kept an eye on the weather. Out of everything they offer at Ojo Caliente, the thing that I most wanted to do was hike. They have some trails on their property – none terribly long, but they looked interesting. 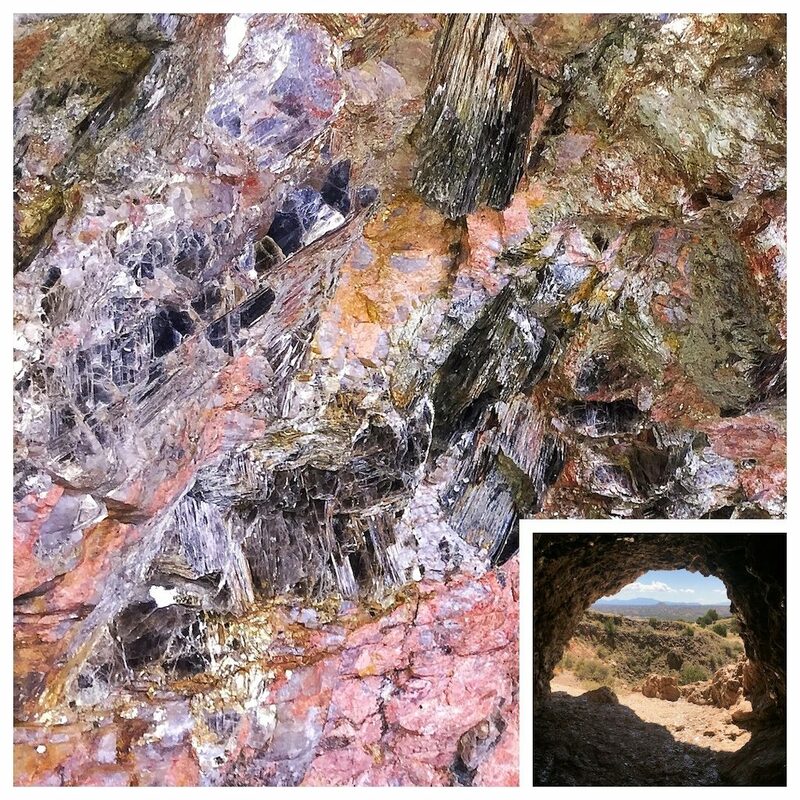 I decided to hike up to the old abandoned mica mine, because who wouldn’t like to see a sparkly mica mine? The trail leaves from the resort’s parking lot, and climbs right from the start, but then levels off a bit for most of the way. You’re following an old roadway, which must have been the road used by the Joseph Mine when it was in operation. Along the way, it’s fairly typical high desert scenery, with dry rolling hills dotted with pinyon and juniper trees. When you get to the mine, you’ll see three holes in the wall, up a ways from the trail on the left hand side. If you hike up around the right side of these, as I did, you’ll find that the first two holes are barren and disappointing – there’s really not anything there to see. It’s the third hole where you strike mica! This one still has plenty of the shiny stuff embedded in the walls and ceiling, and fragments of it scattered all over the ground. Mica is interesting because it flakes into such thin sheets that you can literally see through them, yet angle them towards the light, and they are reflect brilliantly. It’s dark in the old mine, but shine your flashlight around, and it becomes a different world! If you hike to the mica mine, bring a flashlight! Shine a light inside the mica mine, and it glitters! Of course, most people come to Ojo Caliente for the hot springs, not the hiking. 😉 They have pools at different temperatures, and it’s really a beautiful place. The hot springs aren’t inexpensive — it will run you $24 or more for a soak ($38 on a weekend), but you can stay until you’re as pruney as you want. And since you saved all that money by free camping, you’re still ahead of the game, right? There’s also a menu of various spa treatments available. See their website for details. Boondocking campsite. 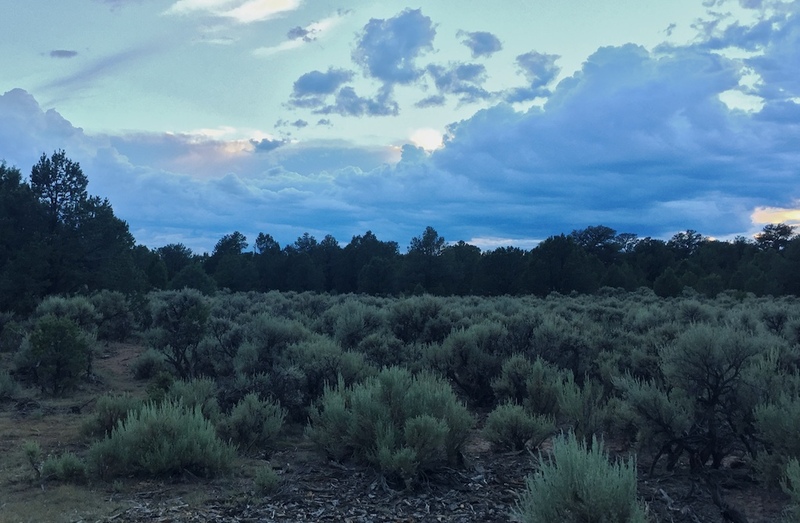 Free camping near Ojo Caliente, with spots along Forest Road 557. Not the most beautiful campsites, but easy, convenient and free. Road may be tough if muddy. Cell service good for T-Mobile.